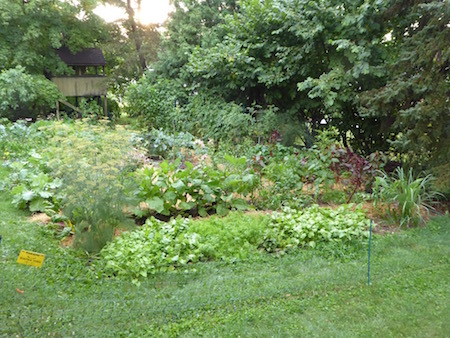 The vegetable garden was slow developing this season but things are finally shaping up and it looks to be a pretty productive and rewarding year. So far the stars of the garden are the eggplants which are gorgeous and have not suffered from the flea beetle attacks that often riddle the leaves and weaken the plants. The beets and carrots are also growing well in thick stands that hide the roots which are developing underneath. 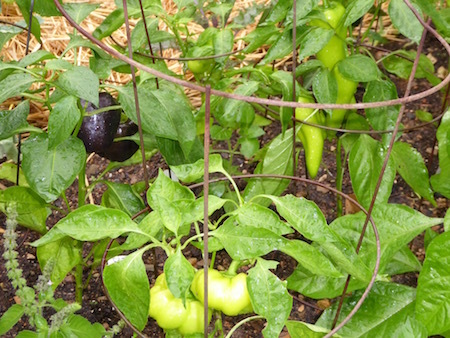 The pepper plants don’t look like much right now but they have already ripened fruits in an assortment of colors and shapes. 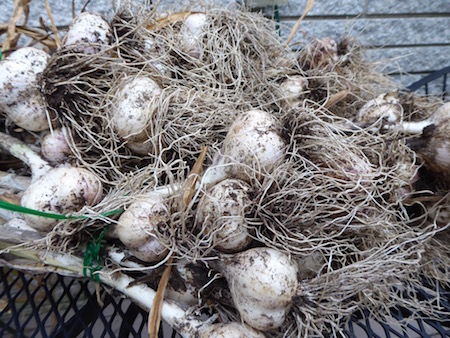 All of my garlic was harvested this past weekend, the bulbs look great and are now bundled and curing before they go into storage. 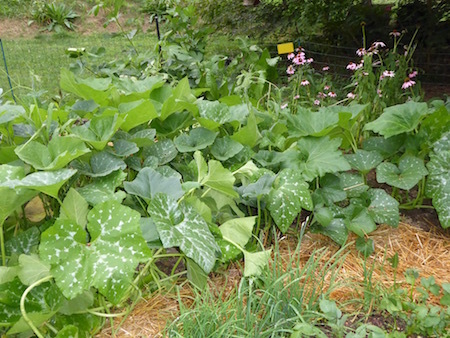 Winter Squash – I usually don’t plant winter squash because of the space that they take up but this year I wanted to try a couple of varieties that sounded interesting, namely Thai Kang Kob Pumpkin and Choctow Sweet Potato Squash. 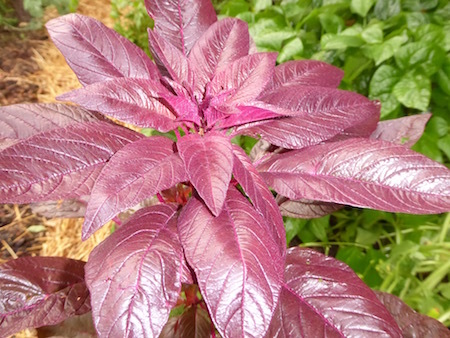 Amaranth – This is one of those crops like epazote and Sacred Basil that you can plant one time and you will have them in the garden forever. It’s nice to enjoy plants that re-seed themselves and produce volunteers that return each summer! 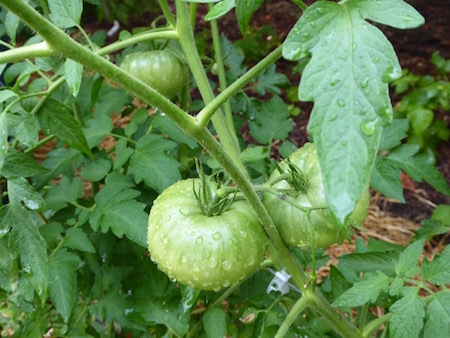 Heirloom Tomatoes – These tomatoes are running behind schedule but will be worth the wait, the vines are looking healthy and disease free but still have a little time before they will be ripe and ready to harvest. 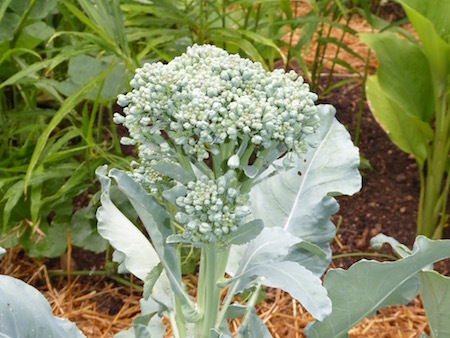 Sprouting Broccoli – This sprouting style broccoli missed the normal spring window for heading but it seems content to bud during the heat of summer and will hopefully offer additional side shoots as well. 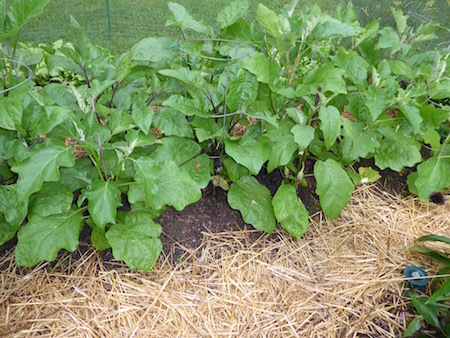 Organic Eggplants – This isn’t the easiest crop to raise in the backyard garden, especially if you choose to avoid all sprays. But when things go well eggplants are such an amazing and attractive plant to have in the garden. 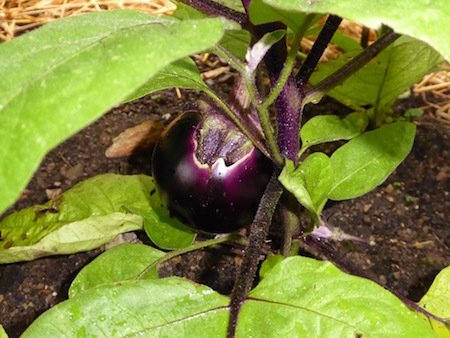 Eggplant Fruit – Here’s a closer look at a glossy purple fruit. There are other varieties planted that will bear fruit that is green, lavender, black, or striped, and in shapes that range from long and slender to large and blocky. 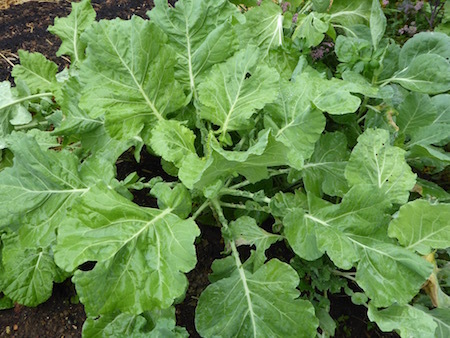 Collard Greens – There are several different collard varieties in the garden, this one is lighter green and has more texture in the leaves. They are all hardy plants that can tolerate the heat of summer and even survive through winter. 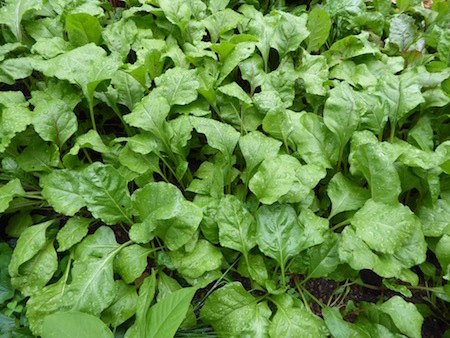 Beets and Beet Greens – Planting beets and carrots in blocks like this provides many benefits as the leaves form a lush living mulch that helps conserve moisture and also restricts weed growth in the bed. Climbing Veggies – Using vertical space in the vegetable garden really boosts production. 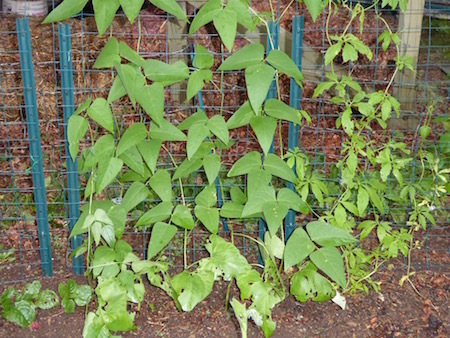 Here lima beans, Red Malabar Spinach, Chinese Yams, and cucumbers all share a simple trellis made of wire fencing. Peppers – There are at least a dozen different pepper varieties in the garden this season from stocky bells to elongated cayenne, and ripened colors that include; red, yellow, purple, orange, chocolate, and even some stripes. 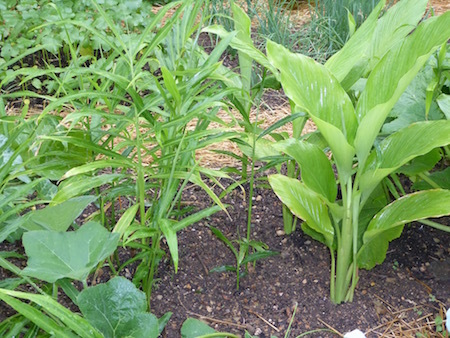 Ginger and Turmeric – Two of my favorite new crops for the veggie garden; home-grown ginger and turmeric are both interesting plants that can be grown successfully by the backyard gardener, even those in northern climates. Gourmet Garlic – So much better than store bought! If you like cooking with garlic than there should be a patch planted in the garden every year, and it’s not too late to start this year since it is typically planted in the fall just before winter. Well that’s it for now but there is plenty of time left to share more pictures later this summer, and I have already started planning and planting crops for the fall and winter gardens! Very specific and lovely post. I also have a Mid-Summer Vegetable Garden. It is a great way to enjoy fresh crops and vegetables in early winter.